Note: This post was originally published before the 7/14 episode of American Ninja Warrior. If you’ve been paying attention, you probably already know that Kacy Catanzaro has advanced to the finals in Las Vegas and will take on Mount Midoriyama, the first woman to reach this stage of ANW! Video of both her runs so far are included below. I’ve been very fortunate to grow up in a fantastic era for sports fans. I was a Bulls fan during Michael Jordan’s prime and saw his famous up-and-under move in real time on TV during the 1991 NBA Finals versus the Lakers. A lifelong Yankees fan, I witnessed their 1990s dynasty not to mention Derek Jeter’s backhanded “flip” to nab a runner at home plate in the 2001 American League Division Series. Oh yeah, and I’ve been around for Mariano Rivera‘s entire career. And as a bonus I’ve had the good fortune to watch my hometown football Giants recently win two Super Bowls they, quite frankly, had no business winning against the heavily favored New England Patriots. And yet for all the tremendous sports moments I’ve witnessed in my 32 years, it was an obscure “game show” called American Ninja Warrior that provided one of the most incredible athletic feats I’ve ever seen. Ninja Warrior, an edited-for-America version of a Japanese “sports entertainment television special” (to borrow some Wikipedia phraseology) called Sasuke, featured contestants attempting to traverse a series of obstacle courses, each with obstacles that make the popular Tough Mudder competitions or old school American Gladiators episodes look like child’s play. Obstacles named Salmon Ladder, Unstable Bridge, and Spider Wall were designed to chew competitors up and spit them out, daring them to come back to next year and try again. 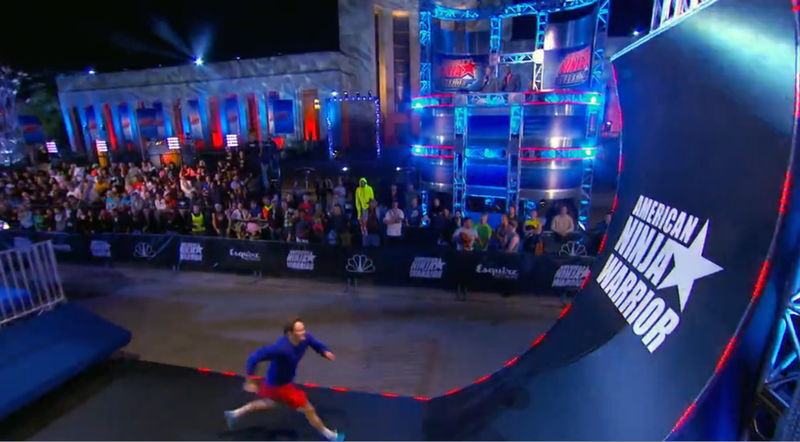 Eventually a short-lived G4 series called American Ninja Challenge—allowing Americans to compete for a spot on Sasuke—gave way to the current American Ninja Warrior format, which takes place entirely in the United States, with the final series of courses, i.e. “Mount Midoriyama,” built and filmed in Las Vegas. The great appeal of American Ninja Warrior is the American Idol-, World Series of Poker-like everyman quality. They are accountants and salesmen and teachers and preachers of all ages (some in their fifties, God bless ‘em!) who are in great physical shape and have any of several athletic hobbies—stuff like rock climbing, gymnastics, or Parkour—that help prepare them to compete, and even thrive, among the best of the best on the ANW course. Some of these men, early adopters of American Ninja Warrior, have become household names (or at least faces) for those of us who have watched ANW for a few seasons. Guys like James “The Beast” McGrath, Dave “The Godfather” Campbell, and Brent “I Don’t Have a Cool Nickname But I Am A Professional Stuntman” Steffenssen come back each season rededicated despite failed runs at Mount Midoriyama—and despite that fact that no American, in six seasons of the competition, has conquered it. And come back they have, with experience their most valuable asset. Having seen what the course is all about, many competitors construct their own obstacles in the off season to practice. (Heck, you can even buy blueprints of American Ninja Warrior obstacles—and it’s only a matter of time before IKEA starts selling ANW kits.) Knowing that they’re physically capable of conquering an obstacle is half the battle. The other half then becomes like any other sport, with many practice hours (hopefully) bringing out one’s best performance on game day. While still very much a niche sport, American Ninja Warrior is steadily growing. 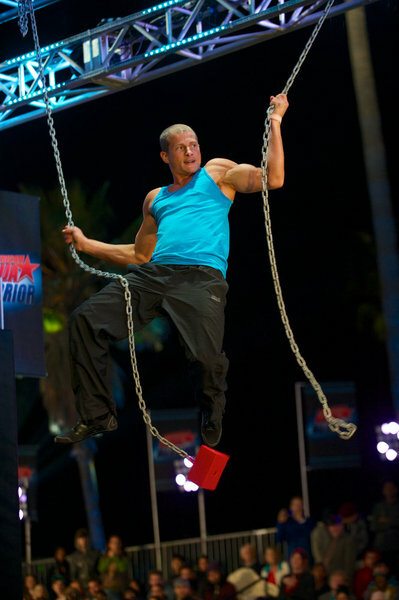 According to ANW‘s executive producer Kent Weed in an interview with The Hollywood Reporter, the show received 3,000 audition tapes for the current season–more than double the 1,200 it received for the prior season. While the body types of the competitors can vary from muscular to toned to lanky, one sort of body is conspicuously underrepresented: the female body. In any given episode one woman’s run at the course might be featured for every twenty men (maybe more than that), and typically those women never advance past the first few obstacles in Stage 1. Yet each season for the last three or four that I’ve watched, more and more women are attacking the course—and getting a little farther along each time. It stands to reason that a tall woman would have the best shot at completing Stage 1, given that many obstacles rely on jumping and running across wide gaps, swinging and reaching, and pulling one’s own body weight horizontally and vertically. So the first time I saw 5-foot-tall Kacy Catanzaro step up to the starting line I didn’t like her chances—until I learned a little bit about her background. Catanzaro, 24, is a former Division I gymnast at Towson University. 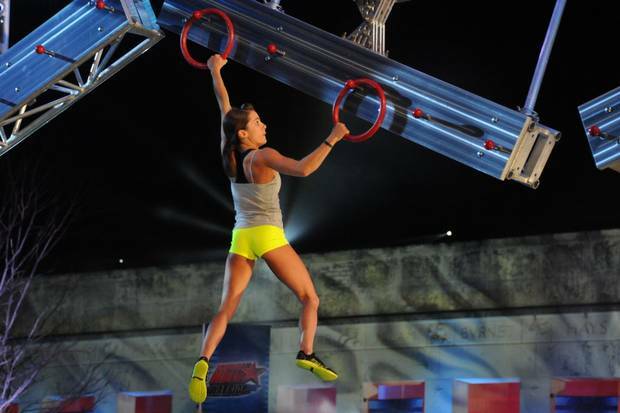 The Dallas qualifying round in 2014 was not her first attempt at completing Stage 1 of an ANW course, so she had some experience on her side. Oh, and her training partner (and boyfriend) just happened to one of the most successful ANW competitors of all time, the aforementioned Brent Steffensen. By the time she reached the wall Kacy Catanzaro already completed several obstacles that many other competitors, men and women, had failed at. Had her run ended with three failed attempts to climb the wall—the maximum allowed before a contestant is disqualified—it still would have been as close as any female had come to completing Stage 1 in six seasons of the show. But it wasn’t good enough for Kacy. Catanzaro, who trained for The Warped Wall and other obstacles using replicas she and Steffensen had built for practice, was relying on flawless technique to make up for a dearth of height. On her first attempt at the wall, it seemed she had the timing just right, but her fingers came up short. With the crowd chanting, “Beat That Wall!”, Catanzaro paused and caught her breath before making her second attempt. Rather than dejection, her face read only of complete focus. Again, she ran full speed ahead, leapt at just the right moment and…she did it! She pulled herself up to the top of the wall, turned around to slam the buzzer that stopped the clock and she was through Stage 1! See Catanzaro’s entire Stage 1 run below. The announcers howled above the crowd noise as Catanzaro stood above everyone there in Dallas that night, pumping her fist and chanting, “Yes! Yes! Yes!” as Steffensen looked on proudly. I had goosebumps. ANW event coordinator Michelle Warnky became the second woman to finish the course, making it up The Warped Wall on her first try in just 3:09 in St. Louis (and, actually, making it look really easy), while rock climbing instructor Meagan Martin later completed the course in 4:46 in Denver. It’s a safe bet that we’ll see even more female athletes qualify in 2015. On tonight’s episode of American Ninja Warrior, at 9 pm Eastern on NBC, Kacy Catanzaro will try to top her already incredible run by becoming the first woman to complete Stages 2. Perhaps she’s still a year away from that feat, or maybe she’ll ride the momentum she’s created all the way to the next round at Mount Midoriyama. No matter what happens tonight, Kacy Catanzaro, Michelle Warnky, and Meagan Martin have already changed the game for women and men. Maybe the eventual next step for American Ninja Warrior is to have separate male and female competitions, as we see at the Olympics, CrossFit Games, or sports like tennis or mixed martial arts (e.g. UFC). Whatever comes next for the sport, we already know that American Ninja Warrior has likely found its newest crop of female stars and perhaps more importantly, the new faces of the brand. **UPDATE** Kacy did it again! On last night’s (7/14) episode of American Ninja Warrior, Catanzaro completed the Stage 2 course and is headed to the finals in Las Vegas! See her full run below.